Betsy Andrews to Read at IUSB This Wednesday!! Mark your calendars! 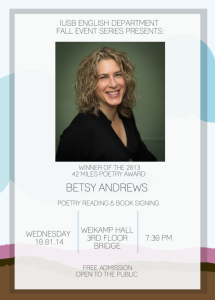 Betsy Andrews will be reading this Wednesday—October 1, 2014—at Indiana University South Bend, hosted by 42 Miles Press and the English Department. Betsy’s poems are powerful and passionately-driven. They are urgent and accelerate the reader forward through their pages, their images, their truths, to a consensus of central issue and potential solution. They are largely ecological and political in their focus. New Jersey is a book-length poem that focuses on the New Jersey Turnpike, while The Bottom focuses on the anticipated environmental impact of Bush’s re-election. Her next book-length poem will focus on the air element and the many creatures involved (birds, planes, etc. ), and she plans for subsequent poems to focus on the remaining elements, earth and fire. Her poems—and her reading!—should not be missed. Her reading will take place at 7:30pm on the third floor of Wiekamp Hall (on the Bridge)—again, on Wednesday, October 1—and the reading is free and open to the public! Please also stick around after for a brief Q&A, small reception, and book signing. Also, if you are interested in reading more about Betsy’s work, click here for a link to my review of The Bottom, and click here for my interview with Betsy about her writing life, research habits, influences and what she’s working on now. 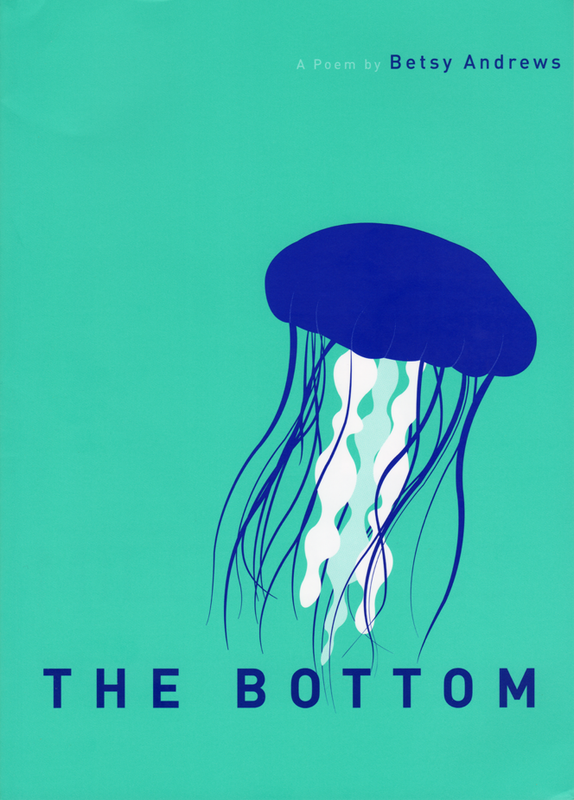 BETSY ANDREWS is the author of The Bottom (42 Miles Press), winner of the 2013 42 Miles Press Poetry Prize, and New Jersey (University of Wisconsin Press), winner of the Brittingham Prize. Her chapbooks include She-Devil (Sardines Press), In Trouble (Boog Press), and Supercollider, a collaboration with the artist Peter Fox. She is also executive editor of Saveur magazine. Next Receiving an Honorable Mention for My Chapbook! !